Turtle owners prize an active pet with varied, vivid shell color. 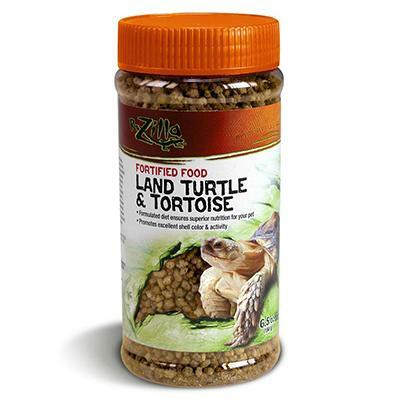 Zilla food is formulated to deliver both, plus the life-lengthening mineral blend owners can't recreate with table scraps or do-it-yourself pet nutrition. 40+ individual ingredients are combined to match the diet of flowers, berries, plants and insects land turtles enjoy in the wild. For extra appeal, we gave each nugget a flower shape. It's all in one easy-to-use screw top jar, safely blended for year-round daily feeding. Ingredients:Ground Corn, Ground Oats, Ground Wheat, Dehydrated Alfalfa Meal, Wheat Middlings, Fish Meal, Dehulled Soybean Meal, Corn Gluten Meal, Dicalcium Phosphate, Corn Oil, Dehydrated Alfalfa Leaves, Wheat Germ Meal, Brewers Dried Yeast, Dried Cane Molasses, L-Lysine, Calcium Carbonate, Salt, Dehydrated Raspberries, Dehydrated Strawberries, Vitamin A Supplement, Choline Chloride, Vitamin E Supplement, Dl-Methionine, Spirulina, Yucca Schidigera Extract, Propionic Acid (a Preservative), Vitamin B12 Supplement, Zinc Oxide, Ferrous Carbonate, Riboflavin Supplement, L-Ascorbyl-2- Polyphosphate (Source of Vitamin C), Ethoxyquin (a Preservative), Manganous Oxide, Niacin, Menadione Sodium Bisulfite Complex (Source of Vitamin K Activity), Calcium Pantothenate, Copper Oxide, Cholecalciferol (Source of Vitamin D3), Beta Carotene, Pyridoxine Hydrochloride, Thiamine Mononitrate, Cobalt Carbonate, Folic Acid, Calcium Iodate, Biotin, Sodium Selenite, Artificial Color, Natural Flavor.